I'm most definitely a typical Millennial in that I order everything from Amazon. Or is that everyone? Well either way, we all know you can pretty much find everything you need in life from Amazon whether it's dog poop bags, bar stools or Trump wigs. I'm especially a big fan of Amazon's own line, AmazonBasics. It's cheap, great quality and ships immediately. Of course as a Travel Blogger, I've done my fair share of trying out travel accessories from Amazon. Some of them were a huge waste of money but these 10 items have changed my travel life for the better. 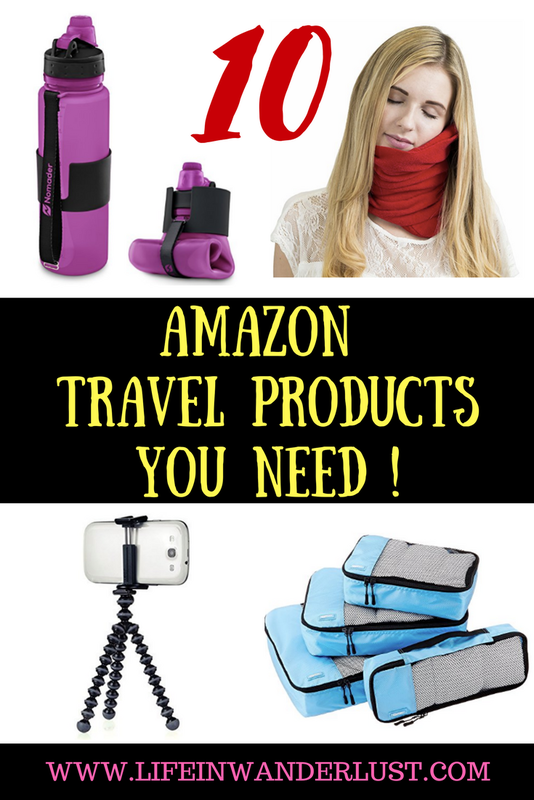 I was inspired by all the "Amazon Must Buys" Youtube videos and decided to share my tried and true Amazon travel products with you! Keeping hydrated while you travel is so crucial yet so easy to forget, isn't it? Also, who really wants to carry around a huge bottle in your already stuffed bag? Oh and who wants to pay $10 for a water bottle inside security? I've suffered through all of these issues and finally found a solution. The perfect travel water bottle is the collapsible bottle. When collapsed, it barely takes up any space yet carries a full amount of water when expanded. Take it through security, find a water fountain and fill this bad boy up! Most flight attendants are happy to fill it up on board for you too. Once you're hydrated, roll it up and put away again! You just saved money, stayed hydrated and your bag still has a lot of space - bam, miracle worker! 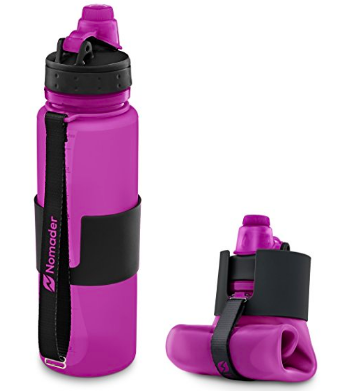 This one is the one I personally own but there are all sorts of collapsible water bottles out there now, so take your pick. 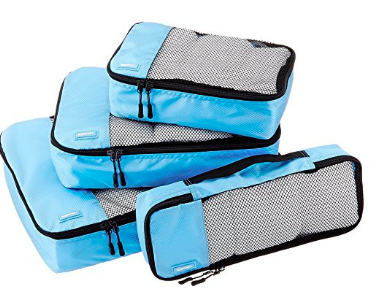 Ok, I know packing cubes aren't anything new anymore to the frequent traveler but trust me, there are plenty of people that aren't aware of how life changing these are. If you're new to packing cubes, they help organize your clothing and prevent them from too much wrinkling. It's so, so easy to see where you packed what! Like I mentioned in the beginning, I love the Amazon Basics line and I was so happy to discover their version of packing cubes. I immediately purchased them and I can personally guarantee they work just as well as other ones (and better quality than some others!) but at a cheaper price. 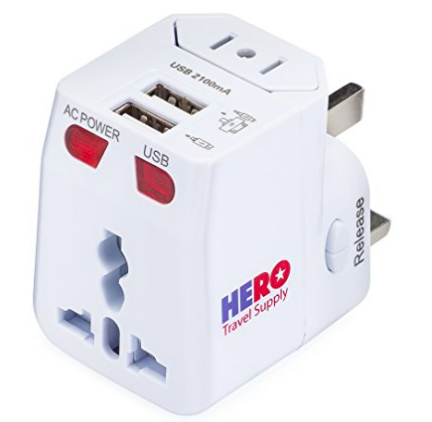 If you're an international traveler, you know how handy a power adapter is. But did you know, most power adapters you can buy in the United States aren't actually adaptable in most of Asia? Because I go back and forth from the US to Japan, I've made the mistake of buying any old adapter. I didn't realize that most power adapters work for the US, Canada, Mexico and Europe but rarely also for Asia. This particular power adapter listed though, works for Asian countries as well and it's a life-saver! I always thought neck pillows were one of humankind's best inventions....until the Trtl Pillow. While I understand it's a little pricier than the typical neck pillows, it's a must have for those of you that travel long distances and hours. I too was skeptical about this odd looking thing but after seeing them on frequent travelers and reading reviews, I had to give it a try. The only thing I regret is not getting is sooner! I gift it to traveling friends and family whenever I get the opportunity. Yes, it's a little bulky in comparison to a blow-up neck pillow that's so compact but not too bad. 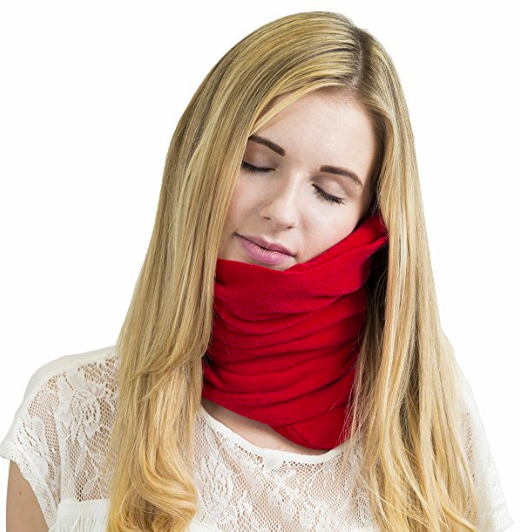 It has a natural contour that makes your neck so comfortable. Sleeping in coach class has never been so easy! I don't know if this is just me but I constantly head to Target's travel toiletry section to buy the $.99 shampoos, conditioners, tooth paste, lotion and more. After all, it's only $.99 right? So cheap! Since that's what I've been doing for decades, it took me a long time to figure out I was actually wasting money - especially for how often I travel. If you travel once a year, buying $5 worth of travel toiletries may not be bad. But if you're traveling often and constantly spending money on mini bottles of whatever, it builds up to result in a huge waste of money. This January, I decided to buy these refillable travel bottles and have only recently started getting into the habit of using these but I love it already. Not only is it economical, it's also environmentally friendly and you get to use products you love! These particular ones are my favorite since there's absolutely no leakage. Beware, some of the super cheap ones will leak! Can I share a disgusting fact? Airlines will never wash their blankets unless it absolutely needs a wash (aka, someone spills something, pukes, pees or poops on it). How do I know this? I worked in the airlines and it's a true fact. Some airlines will clean their first class blankets more frequently but it's not as often as you would hope. That alone should make you want to bring your own blanket but I know that can get bulky. Normally I bring a big blanket scarf with me but for a long flight, this travel blanket is the best travel blanket. 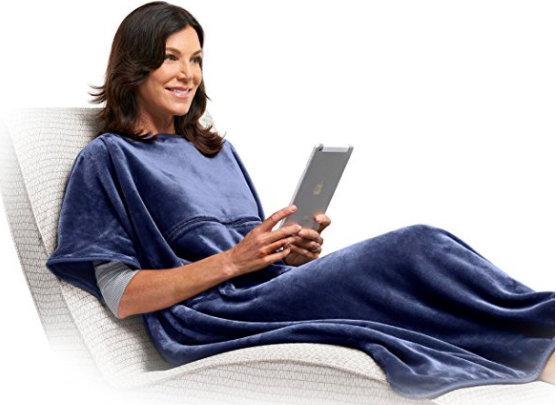 As you can see in the photo, you can literally wear the blanket. No more waking up cold and seeing your blanket on the floor. You can toss and turn all you want; in fact, you can walk around with it if you'd like! Not only that, it's soooo soft. Game changer. I'm not a big fan of selfies in general so I don't own a selfie-stick, nor have I ever considered buying one. Something I have had issues with though, is trying to get a timed photo whether it's of a gorgeous view or a group photo. 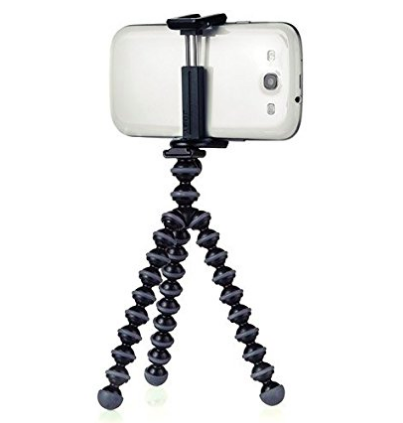 While a mini tripod is useful, it's worth upping your game by upgrading to the Griptight Gorilla phone tripod! Not only does it work as a normal tripod, it will wrap around anything in a sturdy manner and making photography so easy. For example when I was in Maui last November, I wanted a photo of my husband and me yet nobody was around. We wanted the stunning view and a selfie wasn't going to work for that! That's when Griptight Gorilla comes in. I was able to wrap the tripod around a tree branch to stabilize the phone. So flexible, so useful and the best phone tripod for smartphones! Whenever Amazon recommended I buy this product, I would ignore it. It's one of those things that you don't appreciate until you actually truly need it. Like when I'm coming back from Tokyo and my suitcase definitely feels like it's over 50lbs because I packed it with delicious food and fun gadgets. But when I finally purchased it, I was mad I didn't get it decades ago. It's so small that it's always sitting in the pockets of my luggage. Now I never have issues with overweight luggage, or have to worry about it until I get to the ticket counter, let alone having to pay the ridiculous overweight fees! You hook this onto your bag, pull it up and it shows you how much your bag weighs on the screen. That's it! By far one of the best travel products I've ever purchased. As a girl, I have a lot of things I want to travel with and I'm not even a heavy make-up or hair product user. I also hate having too many toiletry pouches with me. 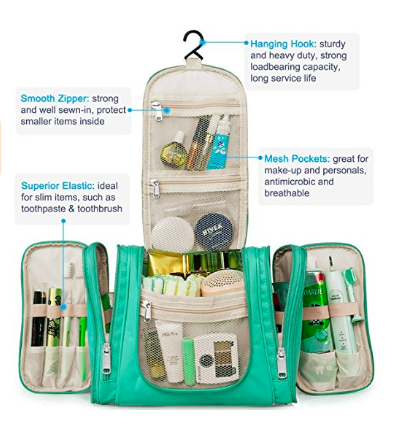 This heavy duty toiletry travel bag comes to the rescue! This bag is lightweight when it's empty which helps a lot. There's tons of compartments that are perfect for small items, elastic slots for toothbrushes and it's completely waterproof! Nothing will stain or soak the bag. One of my favorite things about it is the hook on the top of the bag so you can hang it on the back of the bathroom door. That way your sink doesn't feel cluttered! 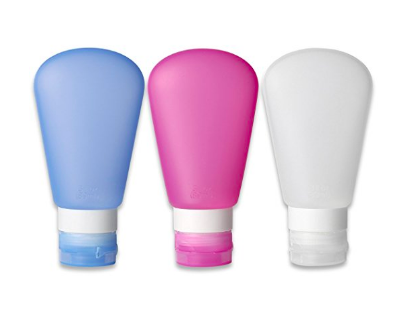 It's so cheap, there's so many fun colors and the best travel toiletry bag ever! Have you ever run around your hotel room looking for a plastic bag to put your dirty or wet shoes in? I'm going to take a wild guess that you have. 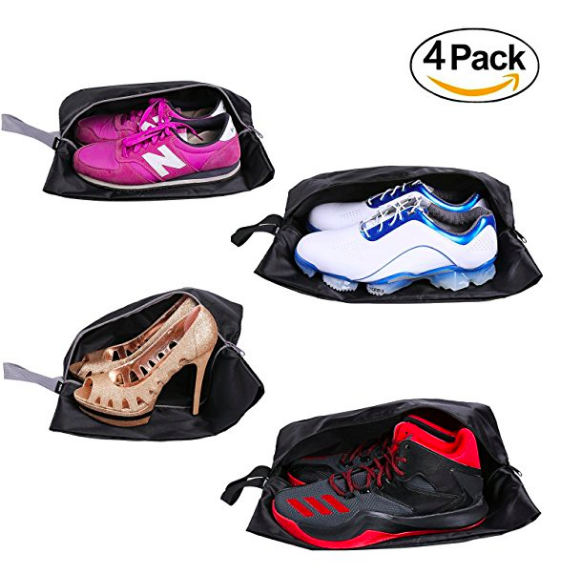 While a shoe bag isn't something anyone would prioritize or immediately think of when it comes to traveling, once you have it, you thank yourself each time. Even if your shoes aren't extra dirty, it's always sanitary to keep your shoes separate from your other items in your luggage, don't you think? These particular ones aren't special but I love that it's a 4 pack, so my husband and I can have a couple each in our luggage at all times. So handy! What do you think of these products? 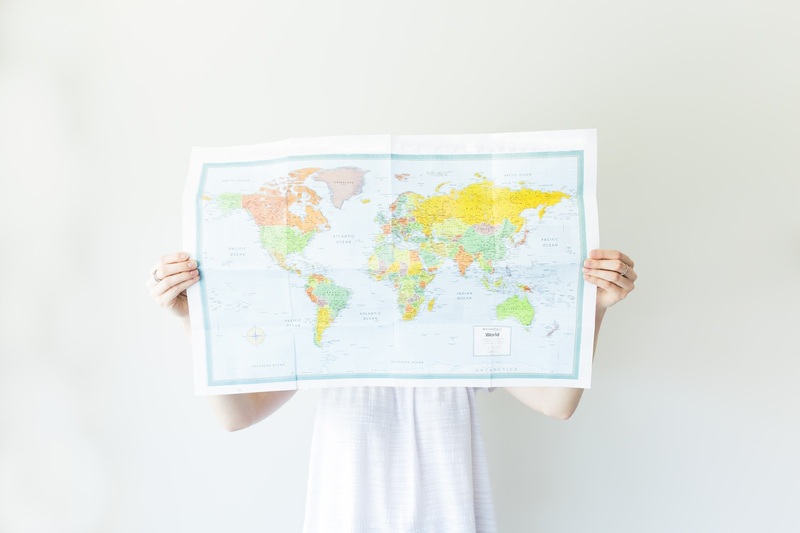 Do you have any products from Amazon you can't travel or live without? Let me know in a comment! The Amazon links are affiliate links to the Amazon Partner Program. However, this does not change the price you pay as a consumer. Thank you so much for your continued support! My sister told me about those bottles - they look sooo useful. I think they'd be great for hiking as well as travel. In fact, the whole list would be great for presents for adventurous friends/family! 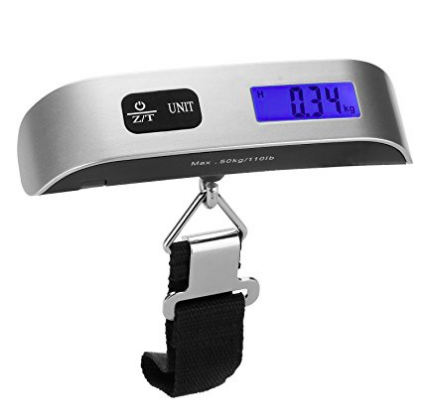 I did not know there was a gadget for weighing suitcases. What a convenience. It's much easier than having my husband getting on and off the scale with suitcases every time I pack something else into them! I have packing cubes (although not from Amazon) and I love them! They make packing and unpacking so much easier, and I find that I can pack more into a smaller space if I use them! what a great list of ideas! I particularly like the neck pillow and the collapsible bottle! I'm curious about the turtle pillow: how does it support your neck? It's magic, honestly! Haha, or science :) The angle you rest your neck on the Trtle just feels PERFECT and SO comfortable! It's hard to explain it!